Every year, I send Christmas cards out to family and friends. I enjoy receiving cards with pictures and letters. It is a great time to catch up with people. Each year, I get a card back from Donald Bergman, an Athabascan Elder from Allakaket. Don is 75 years old. He can no longer write with his right hand after a stroke, so the sentences are a little shaky from writing with his left hand. This year, Don sent me pictures along with his letter. It truly warms my heart to receive a wonderful letter like this from uncle Don. Don is my mom’s first cousin. 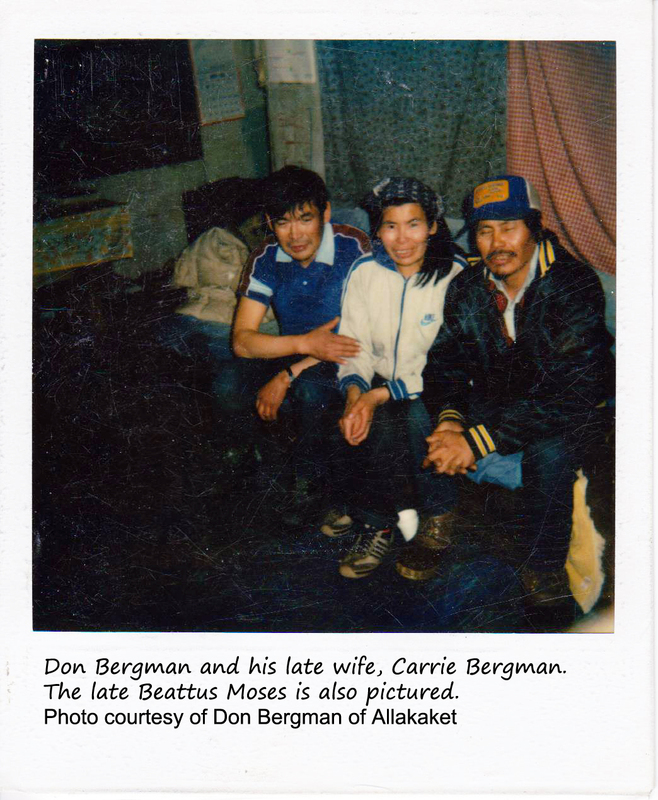 Don’s late wife, Carrie Bergman, was a special lady. She was the nicest lady who always had a shy smile on her face. Don is a trapper, hunter and fisherman. He and late Carrie lived a subsistence lifestyle. 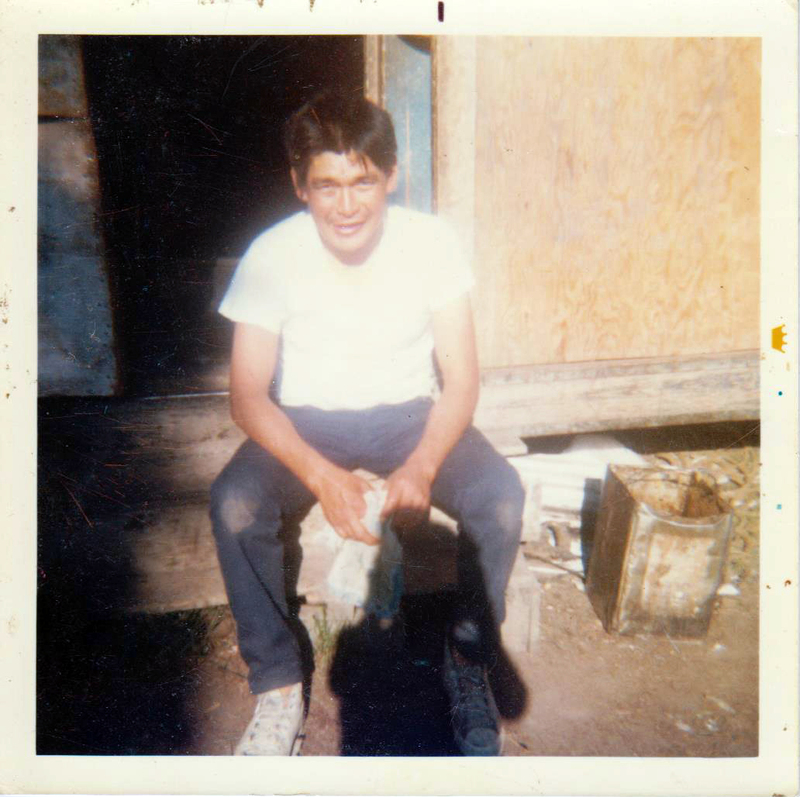 They spent a lot of time in their camp, which is about six miles below Allakaket on the Koyukuk River. When we were small kids, my parents brought us to visit them in camp. 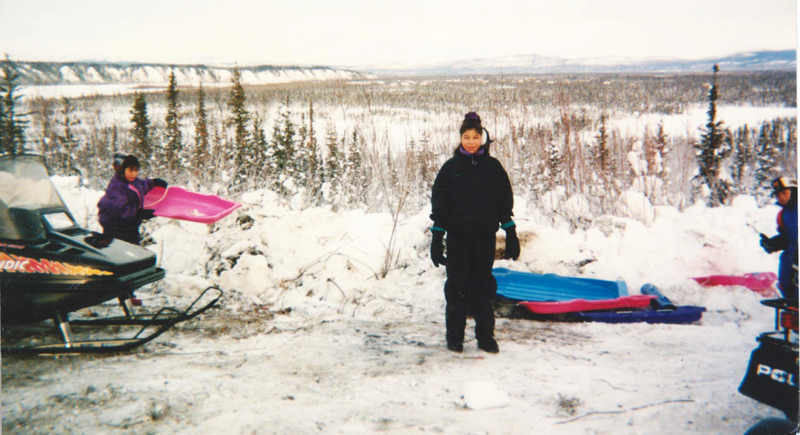 They went back and forth between camp and Allakaket by dog sled. Late Carrie was an excellent skin sewer and knew how to tan moose skin. She made rabbit skin and beaver skin mittens and caribou leggings. My mom, Eleanor Yatlin, said late Carrie was a great storyteller and told some wonderful and funny stories of living in camp. You guys send me nice picture every year, so I send old pictures. 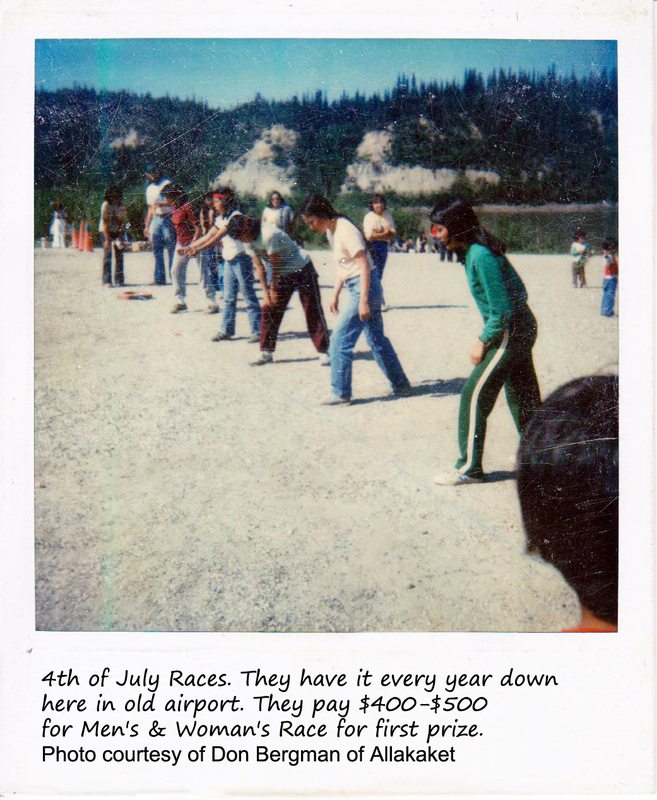 One is 4th of July races. They have it down here in old airport. They pay $400-$500 for men’s and woman’s race. First place that is. I’m doing okay. Stay alone in my old house. I sure like to get out camping and get beaver. No one trap anymore. Prices are good. I like to eat beaver meat, easy to catch. There’s more moose again. They had wolf control last year. There was no moose for couple years. Wolf kill them all. I hope you like these pictures. I got lots of old pictures. Don said he doesn’t have any pictures of himself anymore and that is why he sent me some of his old pictures. The next time I see him, I’ll definitely take some pictures so he can share it with his family and friends. I loved hearing about what is happening in Allakaket. One Athabascan tradition is to respect your elders. Elders have worked hard to raise families and teach traditions. 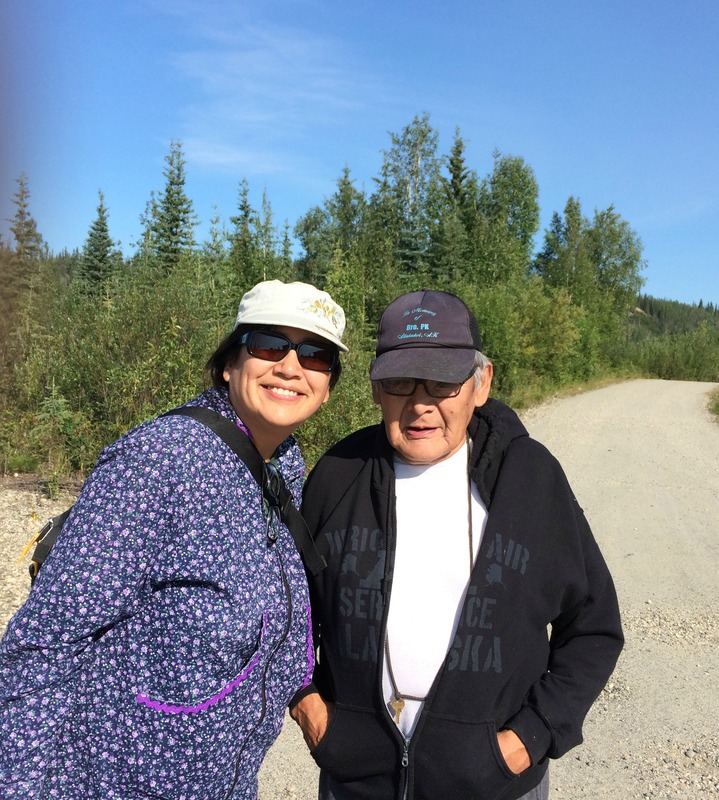 I can’t wait to go to Allakaket and other villages along the Koyukuk River to spend time with and learn from elders. They have a lot to contribute and share. Treasure your elders wherever you may be. They appreciate the simplest gestures of kindness and being connected. Ana basee’ uncle Don Bergman of Allakaket!